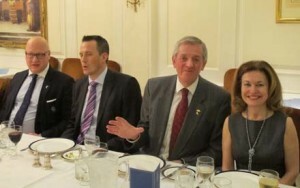 The evening of Monday 1 February was marked with a festive Livery Society Dinner at the East India Club. 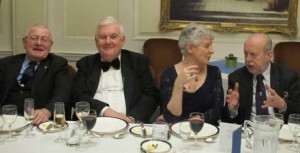 This notable club in St James’s Square was a perfect choice of venue and provided our Liverymen and women with a formal environment in which to gather and enjoy delicious food and libation. The event began with drinks in The American Bar, which was both comfortable and sufficiently large to accommodate our group without imposing on the Members of the Club. At 7.30 we were ushered into the Clive Room where an aperitif was pressed into our hands and a large table was laid for the 25 of us to dine at together. The room was so named after the 18th century soldier-statesman, Lord Clive, better known as ‘Clive of India’ who was a member of the East India Company, to which the Club owes its roots. Replete with paintings of British India and a large central chandelier, the Clive Room allowed us to dine in comfort and independently from the rest of the Club’s activities. The Club’s staff were attentive and inconspicuous, serving first a Jerusalem artichoke velouté with smoked goose, accompanied by Mâcon Davayé Domaine des Deux Roches 2014 white wine, followed by roast free-range chicken fillet with forest mushrooms, button onions and artichoke, accompanied by Château Reynier Bordeaux Supérieur 2010 red wine. The dessert comprised tarte tatin with vanilla ice cream, and ended with Fonseca LBV 2008 port, coffee and the Club’s chocolate. After dinner we enjoyed a speech by our Master, Peter Simeons, who invoked the importance of the Livery Society Dinner for those with five years or less in the Company to meet and engage with fellow Feltmakers without the formalities of some of the other Livery events. His well-chosen words and buoyant tone was encouraging and helped to polish off the indulgencies of the evening. There followed an equally stimulating speech by our Clerk, Major Jollyon Coombs, who thanked our Chairman, Jeremy Bedford for having organised a well-attended 2016 Livery Society Dinner. Indeed, Jeremy did a wonderful job of corralling such a nice group of people together on what turned out to be an evening of blustery weather conditions. 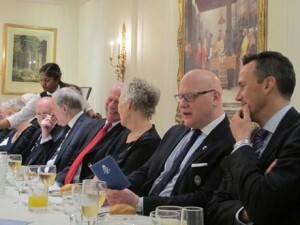 The jovial atmosphere of those present, the excellent food and wine, and the warm ambiance of the East India Club combined to make a tremendously fun occasion. It certainly gave everyone an opportunity for private conversation and to meet others in the Livery, both familiar and unfamiliar, including the Master and Assistants. 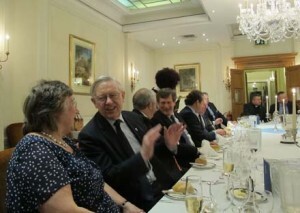 The 2017 calendar cannot come soon enough to convene at the next Livery Society Dinner.